Sand is white or gray. If you live in Florida or some other low-lying coastline, the sand tends to be nearly pure quartz, leading to the white color. In California and other mountainous coasts, there are other minerals mixed with the quartz, leading to a grayer shade. 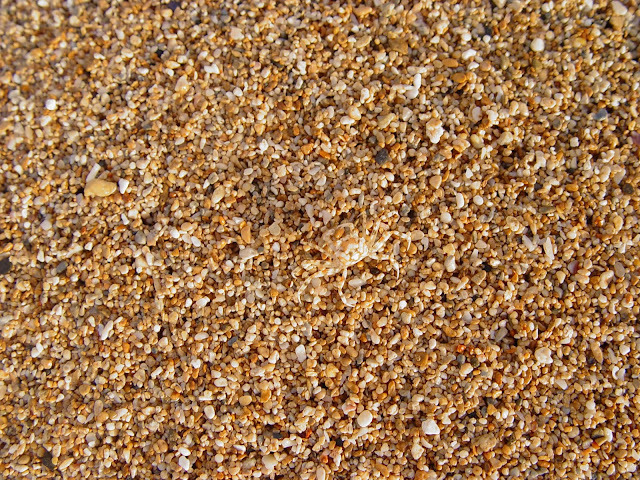 But there is something different about sand on the Hawaiian Islands. 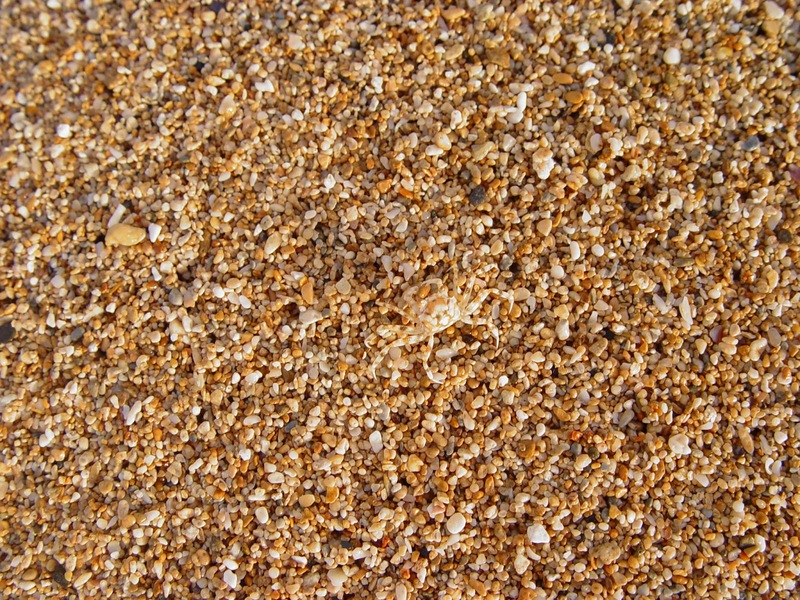 There is hardly a trace of quartz to be found, so the sandy beaches are made of other things. 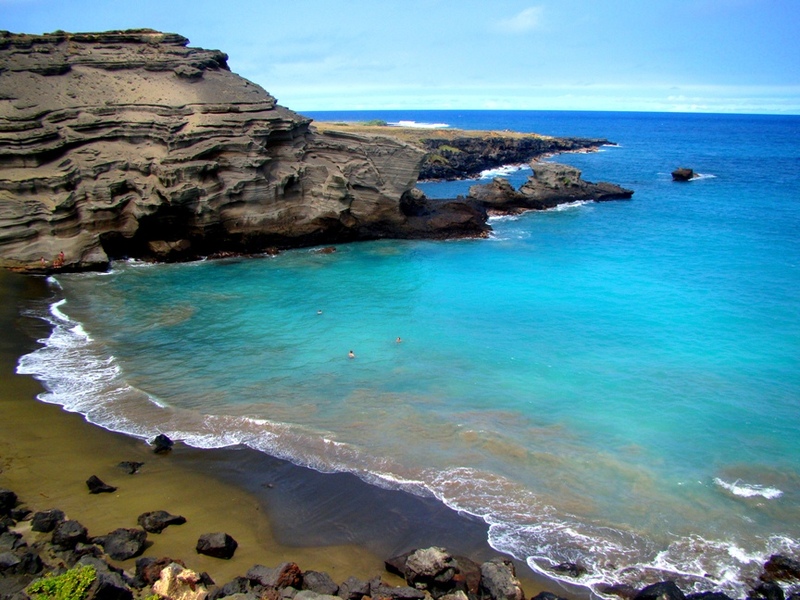 As a result, beaches in Hawai'i can be red, white, yellow, gray, black...and green. The ocean is relentless. Waves are generated in storms all over the Pacific Ocean basin, and the energy is expended against of the shores of the Hawaiian archipelago. Whatever is there is going to be disintegrated into small particles. Much of the time, two kinds of rock face the waves. Basalt lava flows, and coral reefs. Where does all the color come from? Corals can be colorful when alive, but bereft of living cells, the reef is usually white. The sand that results from waves pounding on the margins of the reefs is therefore usually white as well (Parrotfish also chew up the coral, making sand particles). Basalt is black, but the minerals that make up basalt are high in iron, so when the rocks weather, reddish iron oxides are produced that can stain the fragments of coral to produce reddish or yellowish sands, like those seen above, from the south shore of Kaua'i. 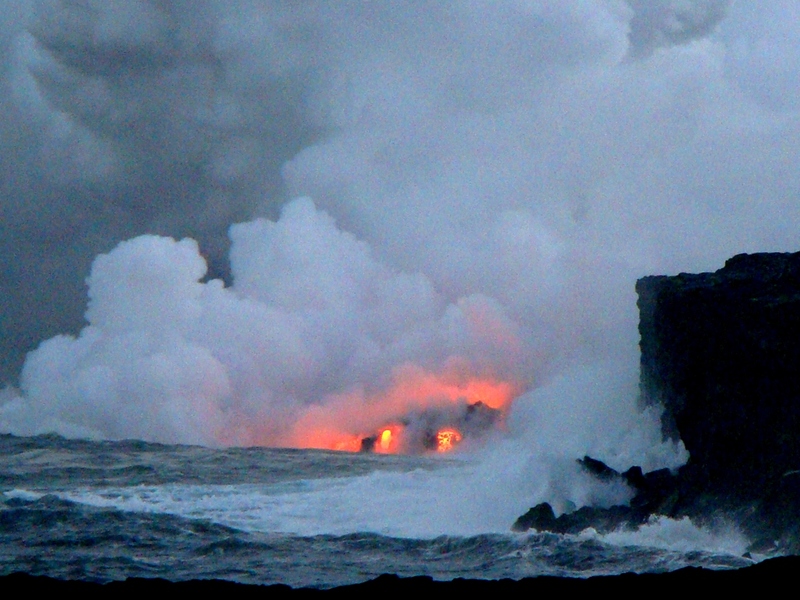 Kalapana-area lava flow reaching the sea in 2009, from vents seven miles away at Pu'u O'o. On the younger coastlines of the Big Island, sand forms in a different way. Lava flows reaching the shoreline can have explosive reactions when encountering the water. The lava shatters into small sand-sized particles, forming black sand beaches. Such beaches will disappear in time, and are thus uncommon. The most accessible beach is Punalu'u on the south side of the Big Island. We paid a visit during our recent exploration. Punalu'u Beach is a pretty stretch of coast backed by coconut trees, with a seaward projection of lava provides some protection from the worst of the wave action. That makes it a great recreational beach, but also an excellent habitat for Green Sea Turtles (Chelonia myda). The beach provides a resting area for the turtles, and the calm water just offshore provides extensive growths of algae that they prefer to feed on. They don't breed here, though. Most of the turtles in Hawai'i nest on the French Frigate Shoals several hundred miles to the northwest. The turtles, honu to the native Hawaiians, were both revered but also used in a number of ways, for food, medicine, and tools. They were doing well enough until the Europeans arrived and started using them for food as well. Their population went into a steep decline until they gained legal protection in 1978. Their numbers have rebounded somewhat in the years since, although they are still considered endangered. It's a serious thing that turtles and people share a popular beach. It's far to easy to harass and injure the slow moving turtles, and tourists can be real jerks at times. Volunteers are often around to protect the turtles and provide some education. If my pictures seem to have been taken from way too close, remember I have a zoom lens! I can be a jerk at times, but not with these beautiful creatures. The most unique sand one can find in the Hawaiian Islands is the green kind. 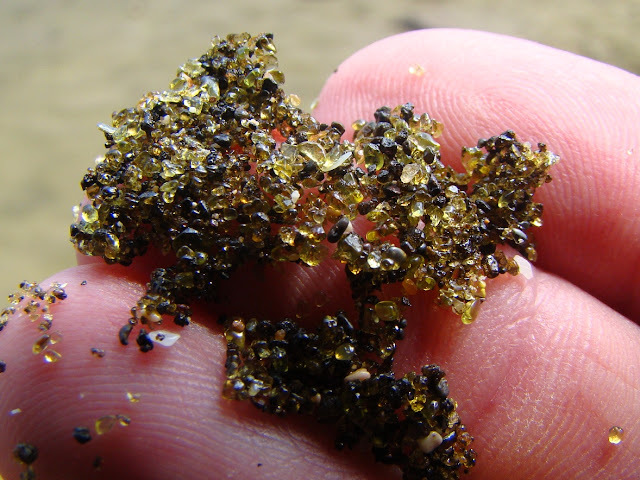 These sands are composed of olivine (also known as the gemstone peridot). Olivine is a major constituent of basalt all over the islands, but it weathers rapidly into iron oxide and clay under normal conditions. One can almost always find a few bits of olivine on any gray or black sand beach, but a green beach is a true rarity. 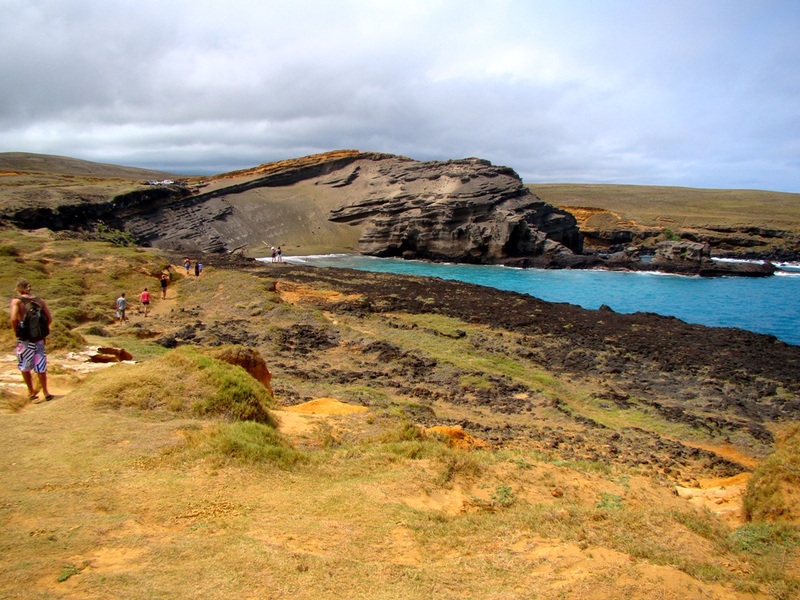 Papalokea Beach (also creatively known as Green Sand Beach) can be found a few miles northeast of South Point on the Big Island. Around 50,000 years ago, an eruption produced a cinder cone of loosely aggregated cinders and smaller fragments. It was rich in olivine crystals, and as waves attack the cliff, the small gems are released immediately onto the beach. There simply isn't enough time for them to weather away like they do elsewhere. Most of my students made the five mile trek out and back to see the beach. I didn't make it this trip, but I did the hike in 2009 and got these pictures. Walking across a hot, windy, arid coastal plain might not sound like an exciting journey, but the destination is clearly spectacular, and the road passes numerous archaeological ruins. 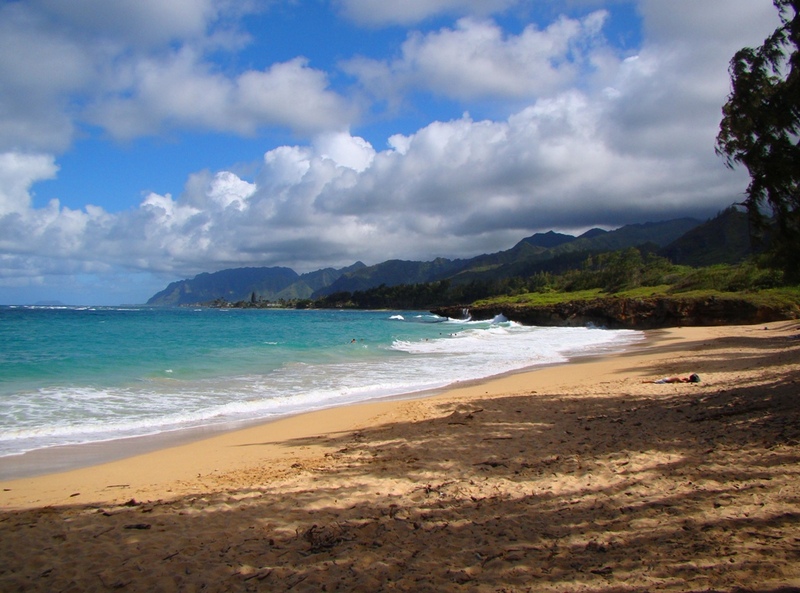 This empty coastline was home to many native Hawaiians who fished the waters offshore. We had spent four days exploring Hawai'i Volcanoes National Park and the vicinity, but we were now headed around the island towards the Kona Coast and Kohala. We were about to see a completely different aspect of the Hawaiian Islands. "The Hawai'i That Was" is an ongoing series that is exploring the Hawaiian Islands as they existed in the years prior to the arrival of humans on the island, and the changes that have occurred since then. amazing the effects of different rock types on the beach sand! cool post!